When I was a teen, I went though a candle phase. I collected anything I could that was funky, weird, and made of wax. Looking back at some of my favorites (a psychedelic tie die mushroom and a faux egg,) its hard to imagine candles as anything other than tacky. These, however, are an exception. This weekend I sat down with three different ideas, and several candle holders. I had a bunch of things left over from Christmas. 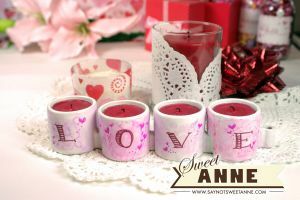 A set of “Chain” candle holders from Ikea (I originally planned to paint “NOEL” on them, but “LOVE” works just as well. ;D ) a few paper doilies I bought thinking I would make a doily wreath like the one in Martha Stewart, a bunch of cinnamon tea lights and one cinnamon pillar candle. With all these gathered together, I went to work. I’ve got Valentine’s Day on the brain, so that’s naturally what I gravitated toward. But, the techniques I think are very versatile. These are the results of my experimenting. Candle with a large votive, that is taller than the candle by about an inch. Candle with a votive that is taller than the candle by about an inch. Clean the outside of the votive carefully. Spray a medium coat of the spray adhesive on the back of the doily. Apply doily to the votive and hold in place until dry. Clean the outside of the votives with alcohol. Using the colors you desire, color blobs on the votive. Dip the Q-tip in the alcohol. Using a very little amount, smudge the sharpie color. Try using both strokes and “dots” to get different effects. If desired, use the sharpie to color letters, or designs over top of the background you have created. Because the design is made in sharpie ink, regular water and heat won’t affect the result. If, however, you need to start over, an alcohol bath will bring your votives back to white. 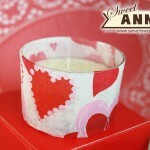 Use the Mod Podge to adhere the tissue paper to the votive, being careful to smooth as you go along. That candle train is such a cute idea! I’m glad you like the candle train! Your impossible challenge is a GREAT idea! This is such a great post!! 3 tutorials in 1!! I love it!! 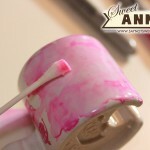 Thank you so much for sharing and linking this post up to Lisa’s Linky List #2!! So glad you like them! My favorite is the Sharpie one- so EASY! Hey dear, its such a unique & beautiful idea, I love how it turned out ! well done! !